Finding the Words is ‘a book about books, about those who write and publish them, and about why and how a born-to-books loner started, ran, made a living by, and disposed of his small firm in the second half of the twentieth century.’ So begins Jon Wynne-Tyson’s retrospect on his life in books, being a memoir of a world of the ‘small independent publisher’ that is now almost completely gone, most SIPs having been swallowed up not by that ‘delicate monster which is Boredom’ but into the maws of the mighty conglomerates, most of which are subject to American dictates. But Finding the Words is no means a dry chronological history or a book-by-book account of the Centaur Press. (For those keen to have publication figures: it published about 150 titles between 1954 and 1994. And of special interest to us here in Scotland is the fact that in 1965 Centaur Classics issued a handsomely turned out crown folio facsimile of the 1938 edition of Robert Burns’ first Commonplace Book, with an added foreword by David Daiches, which Wynne-Tyson writes, ‘has probably sold as many copies for Burns Night prizes as to the nation’s librarians’). Rather Finding the Words is an autobiography of its founder, with anecdotes about almost every aspect of the book-trade on almost every page. For each amusing anecdote that Wynne-Tyson recounts, he counterbalances with a doleful one, whether on backlists, ‘remaindering fever’ or warehousing. On the fraught question of accountants’ hysteria at the cost of warehousing stock, he comes up with a modest proposal first aired in the Bookseller: any publisher swamped with heavy backlists and accountants breathing down their neck should build a shed – a kind of variation on ‘Protect and Survive.’ It is not known precisely how many publishers, small or otherwise, have followed this tried and tested – and free – advice. A close second to accountants in Wynne-Tyson’s experience come newspapers. On their role, and in terms of the diminishing support they can give to small publishers, Wynne-Tyson laments ‘that the relentless increase in new titles … has not been adequately matched by the literary papers’ allocation of reviewing space, while reviewing standards have been increasingly sacrificed to the cult of personality.’ Where literary editors are concerned, Wynne-Tyson concedes their lot is really not much easier than the small publishers.’ Though how sad it is to learn that even a well-meaning literary editor on the Guardian should admit that ‘in general, I think it is a mistake for small publishing houses to rely on the benevolence of literary editors.’ Small publishing houses be warned. In almost any account of a small independent publisher’s life, readers might be forgiven for expecting to find frequent references to wolves and bailiffs approaching doors; here though at least two Rolls-Royces feature in Wynne-Tyson’s autobiography, though neither of them sadly his own – one he had on loan and the other belonged to that other publisher John Calder. (There is also a chapter on the fantasy-throne of the island of Redonda, about which there has been an interesting correspondence in recent issues of the TLS.) Perhaps more in keeping with the precarious existence we come to expect of the small independent publisher is Wynne-Tyson’s description of the Centaur ‘van’, used for transporting the catalogue mailings to the post office. This was ‘a unique vehicle, a long timber box … bolted to the supporting frame and wheels of (his daughter) Tilly’s coach-finished Silver Cross perambulator, bought second hand in the lean year of 1951.’ Now that is more like it! Finding the Words is a charming account of a life in books. Though now retired from his profession and calling, Wynne-Tyson is far from retired from life. One is almost envious of the work and the world that Jon Wynne-Tyson has made his own. 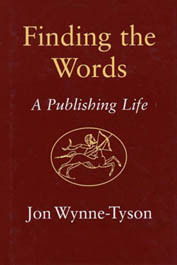 Finding the Words: A Publishing Life by Jon Wynne-Tyson is available from Michael Russell Publishing, Wilby Hall, Norwich (ISBN 085955287X £19.95 HBK).